The sand point at Five-mile. 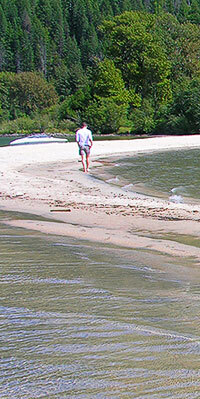 The shoreline of Kootenay Lake is replete with beaches. Some are nestled in tiny bays between rock bluffs, some protrude into the Lake as extensive spits. Some are composed of fine yellow sand, others of gravel, pebbles, cobble, and even boulders. And while the whole lakeside is far from being a continuous beach, enough are found to satisfy the curiosity of most beach fanciers. There are many characteristics of beaches to write about here, so this section is likely to grow. Yet, the good beaches for swimming and sunbathing will not be treated. Rather, of interest will be a recognition and understanding of natural features ranging from the reason for their presence in the first place to details such as delicate swash marks. sources of sand From where does the sand come? longshore drift How does sand move along the shoreline? sand points What causes this unusual West-Arm feature? sorting of sand How does sand get sorted? wet sand Why is wet sand firm and dark? beach cusps What are beach cusps and how do they form? delectable details What are other things to look for?